How the Justice Minister can make these sorts of appointments at all is a wonder. How do we get our political hacks on the gravy train and get to stack the human rights agenda to the conservative side? How indeed. NRT identifies the overt political appointments: Yes, I associate Ken Shirley more with trees (as a forestry lobbyist) than with humans. As for Ravi, most people worked out he would need to be given a consolation sinecure like this for being dicked over by Head Office in the Mt Albert by-election jack-up, and yes he is a Christian, but he does have a CV that reads grassroots community service and that qualifies him. The thing that ought to disqualify him is that he ran for parliament at last year's election - and the one before - for the governing party. That's such an obviously partisan appointment; but in our current Westminster system of government they can appoint whoever to wherever, whatever - and so they give as many of these jobs as they can to their old chums. Winston used to keep a list of them all when National was last in power to expose their excesses, but lost interest when it was his turn at operating the machine. So it's xmas time at Ravi's and Simon Power is Santa. But Brian Neeson!? The only gift Santa should have dropped down Brian Neeson's chimney this Christmas that would in any way reflect the esteem in which Mr Neeson is held by the Human Rights community is if Santa had dropped his guts down Mr Neeson's chimney. FFS. 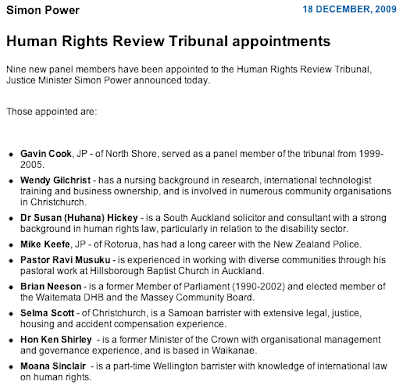 A Human Rights Review Tribunal stipend as a present. Why? Is his wife running for the Nats on the new council? What is the reason? He stood against the Nats when he failed to be selected - he's a traitor to them and here he is being rewarded. It makes no sense apart from the thinking that although he can't be relied upon to be a Nat he can be relied upon to be a bigoted conservative. That's a part of the mix they want on that level. He's there because the words "Brian Neeson" and "Human Rights" just don't go together. He's there to thwart that agenda. They want the tribunal to veer that way because in the new system that has less appeals and avenues of review this body is important and will set precedents for human rights standards. With people like Neeson and the former deputy leader of Act appointed the government is not planning to set those standards very high. When the government sees its duty to appoint a policeman onto every committee - as it does with this one - it doesn't inspire much confidence either. What would inspire some confidence is a commitment to end political patronage - a routine topic of reform discussion : appointments by government to be politically neutral. Ravi Musuku is a fundimentalist christian bigot who is a stranger to the truth and has annoyed most of the Indian community by preaching that Hindu deities are "false gods".